This week we bring you the first part of a Death Korp of Krieg army. 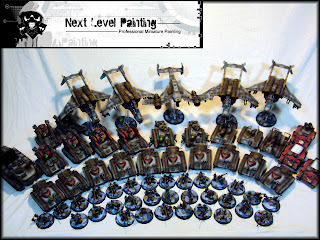 This is with out a doubt, the largest army we at Next Level Painting have done. This army is comprised not only of Forge World Death Korp of Krieg models, but countless Forge World tanks, conversion kits and some sisters of battle for taste. This army is so large that we have to split it up over two posts. It is just that big! Here is the first pics of my converted Chaos havoc with Autocannon. In our previous article I outlined the pieces I used for it. You can see the results are pretty good. The barrel of the Autocanon is longer than the standard Havoc model, but I feel that gives the model a certain "something." Next article will be an actual tutorial on how to make these.